(This is turning into quite a week. I have three reviews for you: good, bad and ambiguous. This is the first: GOOD). At $20 to enter, you will want to think carefully about how interested you are in art before you check this one out. It is somewhat unlike GoMA’s usual material, in that it doesn’t produce the same sense of childlike wonder that some of its more recent exhibitions have. There are no rooms full of finches, strings hanging from ceilings or giant swimming-pool illusions. Those things are very cool and have an important place in bringing uneducated plebs like me into artistic spaces. “The Poetry of Dreams” is more cerebral, much less flashy, and is generally quite traditional in feel compared to my past experiences in this gallery. Much of the exhibition is the standard ‘drawings and paintings mounted on walls’ format, punctuated with a bit of sculpture and cinema. It is not flashy stuff – for a lot of people Dali is the figurehead for the surrealist movement, but having seen his stuff in Melbourne this is quite a different vibe, with very few of his pieces (or influences) apparent. A lot of it is quite ‘quiet’ stuff: intricate and subtle and clever, but not obvious. For this student of non-artsy things, I found this subtlety by turns fascinating and frustrating. Sometimes I had the joy of being drawn into a piece and really learning from it, while in other cases I just didn’t get a lot from what I saw. The cinema was particularly baffling. However, I certainly learnt a lot on that day; the exhibition loosely follows the four or five basic stages surrealism went through in chronological order, so you see its origins and development. 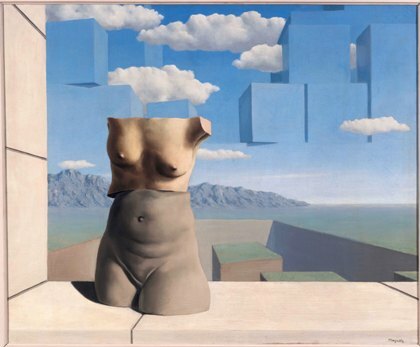 Did you know a lot of surrealists were influenced strongly by the world wars? No, me neither. For me, the big excitement in this exhibition was the sculpture. At least three pieces gave me an intense, visceral reaction. This wasn’t ‘childlike joy’ at all, though: it was more like finding a strange wild animal or maybe a corpse in your back yard. There is a real sick fascination to some of these pieces and it was utterly brilliant. I couldn’t peel my eyes off some of this stuff, especially Giancommeti’s work, and I wasn’t the only one. This is the other perk of this exhibition: the sheer number of “WTF” faces made me wish they allowed cameras for this exhibit. If you’re genuinely curious about surrealism, this exhibition will be a great introduction to it. It you’re out for cheap thrills, go for the sculptures- they really are that good. Alternately, save your $20 and try yourself some of those synthetic cannabinoids (yes, there is legal weed in Australia) before they become illegal. 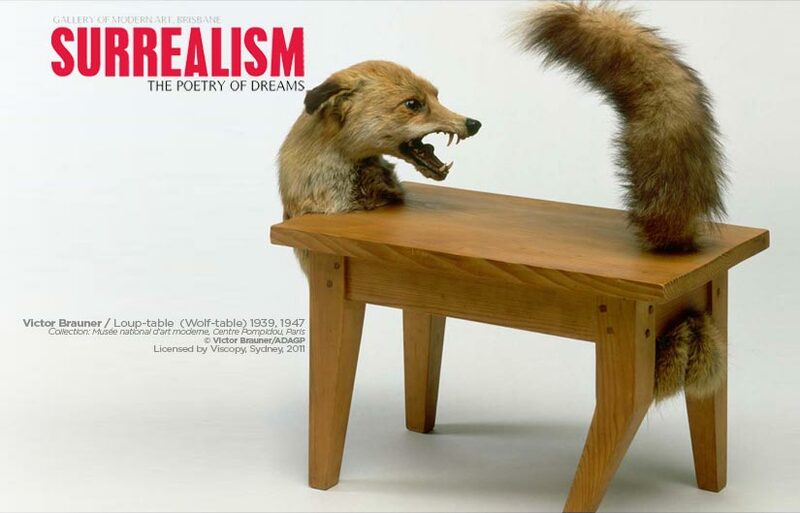 Surrealism: The Poetry of Dreams runs until 2 October 2011. This entry was posted on June 22, 2011 by Philistine. It was filed under Uncategorized and was tagged with Art, GoMA, Highbrow, Thriller, Wolf masks. The wolf-table is creepy. I wonder why he added the balls? Good article! Is “the Bad” next?